Your toilet is outdated. Modern, high-tech toilets with bidet features are beginning to catch on in America. And with amenities like heated seats, automatic lid openers, night lights, in-bowl deodorizers, customizable cleansing jets of warm water, air dryers and more, these are not old-school European bidets. 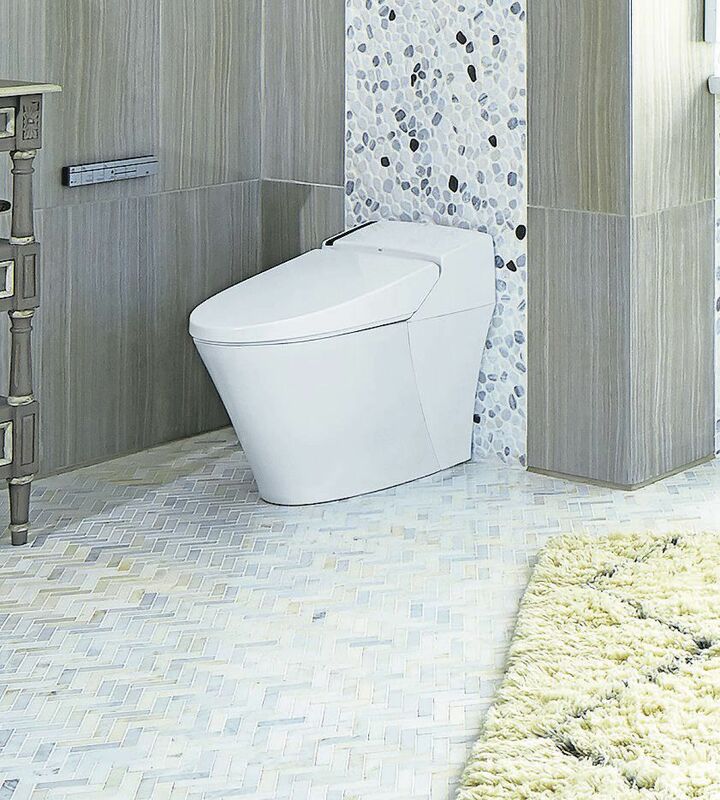 “Once a new user has had the opportunity to try out a smart toilet, it is hard not to appreciate its many benefits,” said Jean-Jacques L’Henaff, vice president of design, LIXIL Americas, comprised of American Standard and DXV. Worldwide, the Japanese company Toto is king of the market, with 40 million Washlet electric toilet seats sold, but they’re also available from manufacturers like Brondell (Swash), Bio Bidet, American Standard and Kohler. Basic models without heated water and air dryers are available for under $75, but Toto’s new top-of-the line Neorest 750H will set you back $10,200. At least you’ll save on toilet paper. It’s hard to explain a high-tech electric toilet to someone who’s never used one. “When you have a chance to test-drive it, it’s a product you want in your life. It’s a better, healthier, more dynamic experience,” said Bill Strang, president of operations and eCommerce, Toto USA. These tech-centric toilet seats wash from the back (and for the ladies the front, too) with temperature-controlled water that doesn’t just rise you clean. It oscillates. It pulsates. It’s an experience. There’s a growing trend of high-tech toilets in hotels, where companies can brand themselves as having something different. They appeal to millennials “who are all about experience,” Strang said. The better models also include cleaning technologies, which means whoever cleans the toilet will be doing it less often. An electronic toilet seat will slightly increase your electric bill depending on the model by about $50 to $65 annually, according to the companies, but look at the big picture. Americans use 36.5 million rolls of toilet paper annually, and a huge amount of natural resources go into production and transportation of toilet paper. Bathroom bidets can save up to 15 million trees, according to Justin Thomas, editor of the website metaefficient.com. “They drastically reduce the use of toilet paper – the production of which uses tons of natural resources. … While it may not directly lower your monthly utility usage, you’ll spend less money on toilet paper and help to save a lot of valuable resources in the process,” said Jon Pinson, spokesman for Brondell, maker of Swash bidet toilet seats. Electric toilets are actually an American invention, developed by Arnold Cohen of Brooklyn, New York, in 1964 with the American Bidet Co. With Americans squeamish about discussing personal hygiene and an uncertainty with the oh-so-French bidet, Cohen found it difficult to advertise. The Japanese loved the electric bidet, though, and he licensed the product to Toto. Later, his patent expired. Today, more than 70 percent of Japanese households have a Toto Washlet; more homes than own microwave ovens, according to the company. Electric toilets are most popular in Asia but also sell in the Middle East and South America, with fewer amenities. You’re more likely to see one in Europe than in America, but things are changing. In the United States, they’re becoming more common on the east and west coasts and other big urban markets like Chicago, Strang said. Electronic bidets are also gaining ground with certain segments of the population, Strang said. For women who have recently given birth, the warm-water action rinses and cleans but also relieves soreness or pain. For people with mobility or dexterity issues such as aging baby boomers, “they are an enabling technology,” Strang said. When you are designing a kid-friendly bathroom, you can focus on fun features, like colorful walls, funky bathroom faucets, and stand-out bathroom vanities. However, it is important to remember that bathrooms can also be filled with potential dangers for kids, so the space has to be safe. Likewise, as your children grow, you will want to design a bathroom that grows with them. Here are some tips to keep in mind as you plan your child’s new bathroom. If you’re designing a bathroom for a younger child, you will want him or her to be able to easily access the countertop. You can opt for a vanity and sink area that is a few inches shorter than the standard height to make it a better fit for your child. Alternatively, consider a bathroom vanity that has a pullout step under the bottom drawer that can give your child a boost. The benefit of having a pullout step is that you don’t have to deal with the inconvenience of having a stool in the bathroom all the time, and you can simply push the step in for good when your child grows and no longer needs it. Even if you only have one child now, including a double basin lets you easily make the bathroom shareable if your family grows. Double basin sinks are also ideal for when your child has a friend spend the night. Although you may think that you can’t find a double basin sink that will work if your bathroom is small, they actually come in a variety of sizes to fit most spaces. There is a range of options you can use to make the bathroom safer for your child. When choosing tiles, be sure to choose a material that is not slippery when wet, such as tiles with textured surfaces. Large tiles are safest and are also the easiest to clean. When you choose a tub, make sure it is easy to get in and out of. Tubs with graduated steps in the basin are especially good for young children. Add a handlebar in the shower for balance. A handheld showerhead will also make it easier for children to rinse their hair without slipping. With our vast selection of bathroom accessories, it’s easy to build a bathroom that meets your child’s needs now and that will grow with him or her in the future. Explore all of our bathroom fixtures on our website, and don’t forget to check out our blog for more great ideas for bathroom designs you’re sure to love. Room design often centers around a focal point, which draws the eye and creates an anchor for the décor throughout the rest of the space. Carrying this idea into the bathroom allows you to select and show off your favorite feature, such as your bathroom vanity, your freestanding tub, or your shower surround. Even if you aren’t sure which particular bathroom feature you want to highlight, you can easily create a feature wall with a different color of paint or a standout piece of art. Once you’ve chosen your focal point, drawing from its design will help you select the colors, finishes, and style of the features you install in the rest of the room for a coherent and appealing final result. Monochrome color schemes are a timeless and elegant choice for any home bathroom. Choosing tile, cabinetry, and other features within the same color family will make your bathroom look more luxurious and ensure it will retain its value over time, regardless of the number of years you plan to remain in your home. Monochrome color schemes are also much more versatile than you might think—a single basic color scheme allows you to easily, quickly, and cheaply change up the style and feel of your bathroom via your bathroom accessories. Choosing new towels or artwork can instantly transform the atmosphere of your bathroom without requiring you to undertake a second remodel. Light plays a vital role in any room of your home, including the bathroom. Modern bathrooms make use of the concept of layering light, combining natural and artificial light sources to create a room that has depth, warmth, and appeal. Installing your shower or tub near a natural light source can make bathing more comfortable and appealing, while ensuring that your bathroom has ample and appropriate task lighting will create an ideal environment for grooming or applying makeup before a big night out. Installing lighting on dimmers and creating personalized lighting schemes is another modern trend that will help you get more from your bathroom. Adding low-voltage lighting to corners and niches will create a brighter bathroom that invites you to step inside, while also imbuing this space with a relaxing atmosphere designed to help you unwind after a long day of work or family responsibilities. A great bathroom starts with a great showroom. We are proud to offer some of today’s hottest fixtures, faucets, vanities, tubs, showers, and more to help you create a modern bathroom that will add value to your home in the years to come. You’re invited to visit us on the web or stop by our Pompano Beach showroom location to get started on your bathroom remodeling project with the help of our knowledgeable showroom staff. If you’d like to find out more about the latest bathroom design trends and must-add options, please check out our bathroom blog archive. Should All Your Bathroom Finishes Match? The finishes you choose for your faucets, fixtures, and hardware will play a significant role in the final look of your bathroom. Brighter finishes, such as chrome, reflect light and can open up a space to make it feel larger and airier. Darker finishes, such as oil-rubbed or brushed metals, imbue your bathroom with an Old World atmosphere and a luxurious, expensive feel. When choosing your bathroom finishes, look to the color and style of the other elements in your bathroom. Brighter hardware on a darker bathroom vanity can create a playful contrast, while dark-on-dark choices further underscore the elegance and luxury of your bathroom space. Installing the same finishes throughout your bathroom will create a cohesive look that will help the room feel finished and complete when you step through the door. While installing bathroom faucets and fixtures with the same finish throughout your bathroom may seem like the simplest solution, it is not always the best one. Homeowners often prefer a mixture of metals in the bathroom for personal or aesthetic reasons. Alternatively, you may have difficulty finding the hardware and faucets you like all within the same family of finishes. Although many interior designers do say it’s more difficult to mix and match finishes in the bathroom than the kitchen, it’s not impossible and is often quite fun for homeowners to find the perfect mix of metals and finishes for their bathroom renovation. One of the simplest ways to easily mix metals in the bathroom is to choose faucets, fixtures, and hardware with the same style, even if they feature different finishes. The similarity of style will tie these pieces together to overcome any difference in color and finish for a room that still feels complete. If you prefer an eclectic or collected look, mixing fixture styles and finishes will help you easily achieve this aesthetic. While this look thrives on highlighting your unique combination of styles and preferences, it’s still best to keep your choices down to two or three different metals to prevent the room from feeling haphazard, rather than intentional. Our Pompano Beach showroom is here to help you find exactly the right bathroom accessories, fixtures, and features for your home. We carry popular quality brand names such as Alno, Inc., California Faucets, Axor, Barclay, and THG Paris. If you’d like to find out more about our selection of kitchen and bathroom hardware and accessories, please stop by our website to browse our inventory or take a look at our gallery of past projects. You can also keep reading our blog for more bathroom renovation and decorating tips to get you started and keep you inspired during your bathroom remodeling project. The type of bathroom you’re remodeling should influence its ultimate floor plan and design. A powder room will feature a very different final look than a master bathroom, so it’s important to take the function of the bathroom into account before you start choosing fixtures, finishes, and appliances. Powder rooms are typically functional bathrooms that receive frequent everyday use; they also require only a toilet and sink to get this job done, especially if space is limited. By contrast, a guest or master bathroom should include a bathing area in addition to the toilet and sink. Master bathrooms also tend to feature larger bathroom vanities to provide both storage and counter space for daily grooming. The number of people likely to use a bathroom on a given day should also affect its design. Creating a bathroom layout that provides sufficient storage and space for the occupants who need it will ensure your remodeled bathroom is comfortable and convenient throughout the years. When designing a bathroom to serve several children or guests, for example, you may want to consider installing double sinks and a larger vanity to accommodate added storage and multiple occupants at the same time. By contrast, if you’re simply redesigning a powder room that will only serve a single occupant, you can instead focus on saving space by installing a pedestal sink or a smaller, less ornate bathroom vanity. Master bathrooms in particular are often designed with multiple occupants in mind; separating the toilet inside a water closet and designing a large, walk-in shower that can accommodate two is one of the best ways to ensure your master bathroom is not only comfortable for you, but appealing for future buyers as well. Bathrooms can benefit from a design that reflects the preferences found throughout the rest of your home. Creating a bathroom that meshes with the design of your living spaces will help to bring this room into step with your home as a whole. Carrying the aesthetic of your home into your bathroom ensures that this space feels like a coherent part of a bigger picture, rather than a disjointed afterthought. Even if you want to try out a bathroom design that differs from the style throughout the majority of your home, consider bringing in colors, textures, or patterns from your other living spaces to tie these rooms together in a subtle way. If you’re ready to get started on your bathroom remodeling project in Pompano Beach, our experienced staff can help you choose the features, fixtures, and accessories that will work best in your new space. We carry everything from bathroom vanities, mirrors, and accessories to showers, tubs, and lighting. Please take a look through our website to find out more about us and the products we carry, or scroll through the rest of our blog archive for more tips, ideas, design guidance and renovating news. Once your bathroom remodel is complete, it’s important to care for this space properly to keep your fixtures and finishes looking their best. Good maintenance and cleaning will reduce wear and tear to prevent premature replacement, while also maintaining the value of your investment. However, time spent cleaning your bathroom is time you aren’t able to spend on leisure or other important activities. Building ease of maintenance into your bathroom remodel will reduce the amount of time you spend cleaning without sacrificing your goal of a sparkling bathroom. Over time, moisture and humidity can take their toll on your bathroom’s finishes and fixtures, leading to warping, discoloration, and mold or mildew growth. One of the best ways to make your bathroom easier to clean and prevent many of the problems associated with high humidity is to install a good exhaust fan. Ventilation keeps your bathroom fresh and moisture-free by helping to draw in fresh air during and after a shower or bath. However, an aging fan may no longer provide sufficient ventilation for your bathroom; additionally, older models are often quite noisy, which makes them inconvenient or undesirable to use. Installing a new exhaust fan with quieter operation will ensure that your fan is both comfortable to use and capable of removing moisture effectively to protect your bathroom over the long term. Storage is the key to efficient organization and less clutter. By reducing clutter in the bathroom, you’ll be able to clean surfaces much faster without the need to move or rearrange items as you clean. Limiting the number of items that remain on your counters regularly can even reduce the amount of dust that accumulates in this room to further speed your cleaning efforts. Finally, keeping your counters, floors, and other areas clear can also minimize the risk of scrapes, scuffs, and stains from toiletries or other items that might require deeper, more focused cleaning to address. During a remodel, installing wall-mounted toilets, sinks, and vanities is a step toward less bathroom cleaning over time. Wall-mounted fixtures make cleaning your bathroom’s floor much easier; mounting fixtures on the wall also makes it simpler to spot leaks or other issues, rather than allowing signs of a problem to hide beneath furniture or fixtures that sit closer to the floor. If you prefer vanities or storage cabinets with legs, opt for choices with longer, thinner legs if possible to make viewing and reaching the space under these features easier. When there are few or no obstacles blocking the floor, sweeping, mopping, and vacuuming your bathroom becomes much less time-consuming, allowing you to spend less time in general focused on your bathroom and more on the other important tasks on your schedule. Building your bathroom for aesthetics and cleanliness is easy with the right products. We are proud to offer some of today’s most popular vanity, shower, and tub designs, allowing you to select exactly the features you want in your new Pompano Beach bathroom. If you’d like to learn more about us or take a look at some of our products and brand names, please stop by our website, where you’ll also find store information and directions to our bathroom showroom. You can also scroll through our blog archive for more great bathroom remodeling information and inspiration.